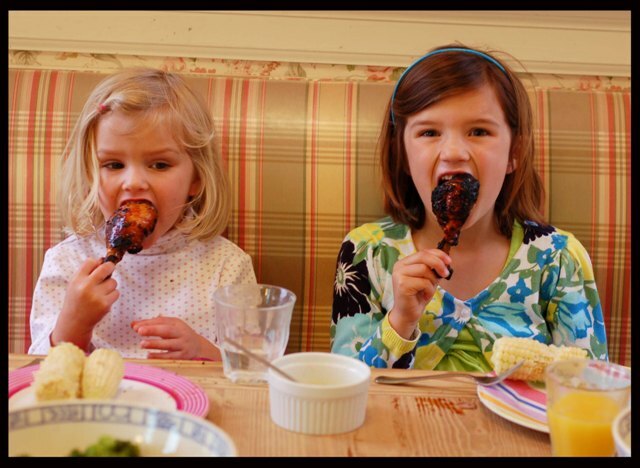 How do you get your picky children to eat chicken? By giving them this foolproof kid friendly Candy Chicken recipe. You will have them begging for more. 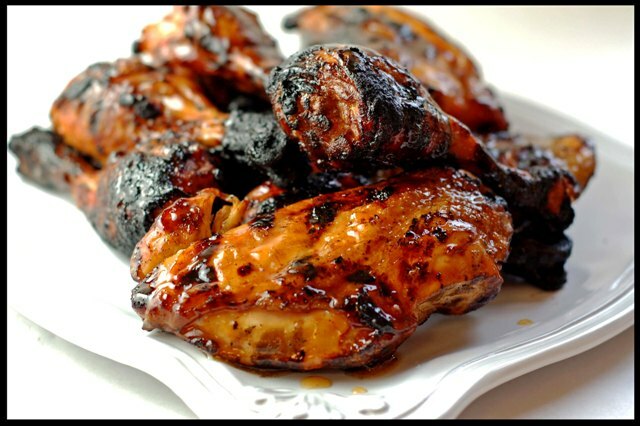 Simple bbq chicken is basted with a sweet, but tart glaze until it is golden brown. The story of MEM. I have never really told the story of MEM, though, I have spoken of them fondly and often. MEM stands for Max, Ella, and Maggie; otherwise known as, Monkey, Peanut, and Mags or Magalicious. So you ask yourself, who are these mystery children? No, they are not the secret children we keep hidden in our apartment! No, they are not our nieces and nephews – we do have 6 nephews and 2 nieces but they all live far from us. About 8 years ago, I became restless. I was 35 and ready to move on with my life; no more roommates. At the same time the dot.com was starting to crash and people were losing their jobs left and right; mine was becoming very unstable and I was very unhappy, despite, actually liking what I did. After a fantastic winter of skiing and playing in Tahoe with friends, two of us decided to skip off to Bali for 3 fantastic weeks. It was there, that I realized I needed to make some major changes in my life. I even contemplated quitting my job and continuing my travels from there, but, then the logical part of me kicked in and I came home. Once home that journey of change began. Unfortunately, rents were still sky-high and no one was hiring ……. not even a waitress job that could get me out of my unhappy situation for a while. After 4 months of continuing the search and hitting interviews, I became pretty desperate at work one day. While scouring the ads on Craigslist, I came across one looking for someone to care for a couple’s 3-month-year-old son. Now, this was definitely not the field I was in (I was working for a start-up as a facility manager) but caring for a 3-month-old could not be any more difficult than looking after an office of a bunch of 30-year-olds that were equally as demanding. So, I polished up my corporate resume and sent it off. Not more then 30 minutes later, I got a reply, that they wanted to meet me – I am sure they just wanted to meet the insane person whose resume had no child experience; but, hey, I had babysat most of my teens, taken care of three younger sisters and occasionally watched (played) with friend’s kids and besides I was energetic and compassionate; I knew I would be perfect. Long story short, I liked them and they liked me and they had this bouncy bubbly baby boy who seemed to take to me. They also had a one bedroom cottage with a backyard and a deck, which could be mine. This was definitely the blessing I had been searching for. It has been 8 years almost. Eight adventurous and wonderful years actually. So much as happened in those 8 years, from being able to be on my own, falling deep in love (with Laudalino), building new and exciting relationships (Will & Evelyn, et al), enjoying life more, being asked to be Mag’s godmother, and learning to live life through the eyes of a child (MEM). Now, don’t get me wrong, there were some ups and downs, especially after days of dirty diapers, if I wondered to myself, if I had lost my mind; but, then I would get a hug or a smile and it would all change. Then about three years ago, I found out, that I would not be having children of my own and it all kind of came together. There was a reason that I answered that ad. There was a reason that we were all introduced. And it was all starting to come together. My role has evolved and changed the past couple of years. The kids grew up, started school and started becoming their own persons. I started craving being back out in the business world, so I came out from behind the scenes and started working with Lenny at his company and now I only spend two days with MEM, which is mostly time with little M. We try to sneak in special time whenever possible, as well Laudalino and I still live in the little cottage, which we have grown to love, and we keep an open door policy with MEM. Now you are probably asking yourself what does this all have to do with ‘Candy Chicken‘. This past weekend, I stayed with MEM for three nights while W & E took a long weekend. It is always fun for the four of us to have these “SUPER BIG SPECIAL NIGHTS” as it means lots of fun, games, playtime, and cooking together (the girls loved peeling shrimp & making meatballs this time around) Unfortunately, we do have to schedule a time to EAT! Evelyn as well as her mother, make this great grilled chicken. ‘Candy Chicken’. This is a great dish, that any child will love, young or old. It is moist, crispy, slightly tart and slightly sweet. We served it with steamed white corn and melted butter. Melt butter. Add sugar and lemon juice, stir over low heat, until sugar is melted. Stir in paprika and season with salt, to taste. Lightly season chicken with salt. Heat bbq according to your directions. Grill chicken until almost cooked through. The last 15 minutes, lightly baste all sides of the chicken and continue grilling until golden. 13 Responses to "Candy Chicken"
Over from twitter....... This looks so good and I don't think you need to be child to love good chicken! Copied and pasted! Thanks. What a wonderful story! Sometimes you find the best things in life by taking a chance, yes? The chicken sounds wonderful, will have to give it a try with my picky bunch. What a great sounding meal! Yum! Thanks for sharing another great recipe! I am loving your blog! This looks delicious! The kids are sure to eat it if I call it candy chicken. Thanks for sharing! I love when people call their meat candy...I had a steak in Argentina that was my steak candy. Would love to try your chicken recipe! That looks fantastic! Not just for kids! I loved this story because I have a similar one. I have been the best friends of twin boys since their birth (neighbors). Mom lost job and had good reason to not ask the crazy nanny back. I jumped on it, across the street, I can cook, blog and be with them. Never in my life would I have guessed, coming originally from corporate world. But I don't have my own children (step-children) and these boys have become a huge part of my life. My husband and mom are very involved too. Your story was marvelous because I've been wondering if I should ever talk about this. Every day is a marvel, and they have amazing palates for two!